The first time I visited Bellefonte, I let out a huge wail after someone slapped my rear and I haven't been the same since. It took me decades to muster up the temerity to return to the town of my birth, but I finally found the time to give it another shot, and I'm happy to report, there was no violence involved. 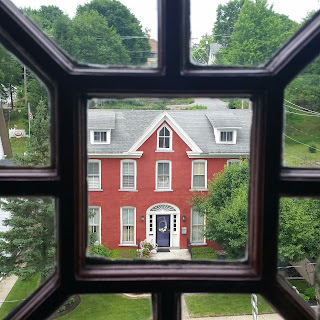 I lasted visited on a cold, winter weekend in 2015 when the air was frigid and the sky overcast, but my room at The Queen Bed and Breakfast located on Linn Street was cozy and comfortable. I quickly fell in love with the small town and the romantic Victorian architecture. Soon I was dreaming of residing in one of the stately mansions until reality set in and I imagined the heating bills. I awoke from my reverie when the stars in my eyes morphed into menacing dollar signs. The Reyolds' mansion located on Linn Street is just one example of the beautiful buildings in Bellefonte. That cold November afternoon, I watched Talleyrand Park whiz by from the warmth of my car and vowed to return when the weather was warmer and the grass greener. Last weekend I finally returned to Bellefonte and once again enjoyed the hospitality of Nancy Noll at The Queen. 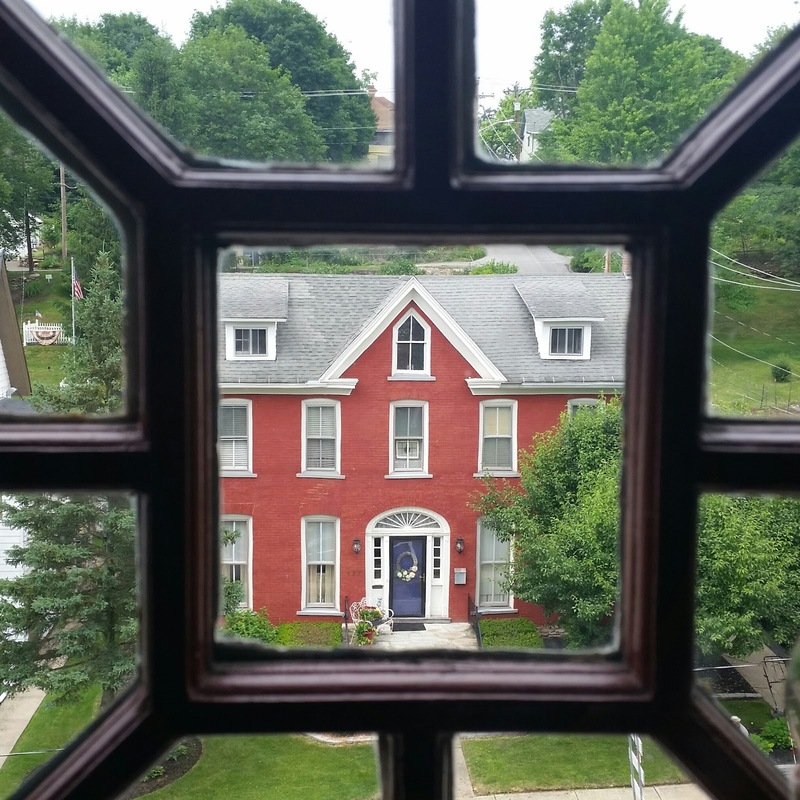 The Victorian bed and breakfast is located within walking distance of downtown, yet residential enough to be evocative of living like a local. Noll seems to think of everything to ensure guests' comfort, from lights that turn on automatically as you pad down the hallways, to providing coffee, tea, and mini-refrigerators on each floor. During this excursion, my husband and I stayed in the Governor's Suite. 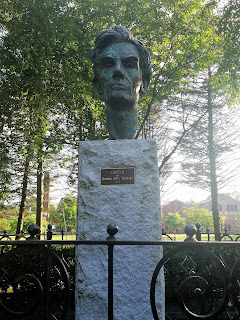 Bellefonte breeds Governors, it seems--a total of seven native sons have been elected, hence the name. Our room was spacious and thoughtfully appointed with a fishing theme, luring one's interest with interesting items at every turn. We slept soundly--the king-sized bed was a dream and the lovely, bright, separate sitting room was perfect for reading, or writing a blog, for instance. The Governor's Room at The Queen with its incredibly comfortable King-sized bed. A bright and cozy sitting room, perfect for reading or working. A prelude to delicious eggs benedict. Since Talleyrand Park is adjacent to Big Spring Spirits, I thought why not take a little detour for a large libation. Founded in 2014, the distillery, which has a cocktail room and tasting lounge, is run by Penn State grads Paula Cipar and Kevin Lloyd, who repurposed space in an old match factory. The building dates back to 1931 and is listed on the National Register of Historic Places. Finally, I returned to Talleyrand. Lush and in full bloom, it made for a bucolic tableau. Few were visiting the park that sunny afternoon other than several small children frolicking on the playground and a few teens conversing on benches. A gazebo is available for picnics and coin-operated grain dispensers allow visitors to feed the huge fish that swim languidly in the waters below. Another homage to the past located in Talleyrand Park is a memorial to the seven Pennsylvania Governors who hailed from the area. 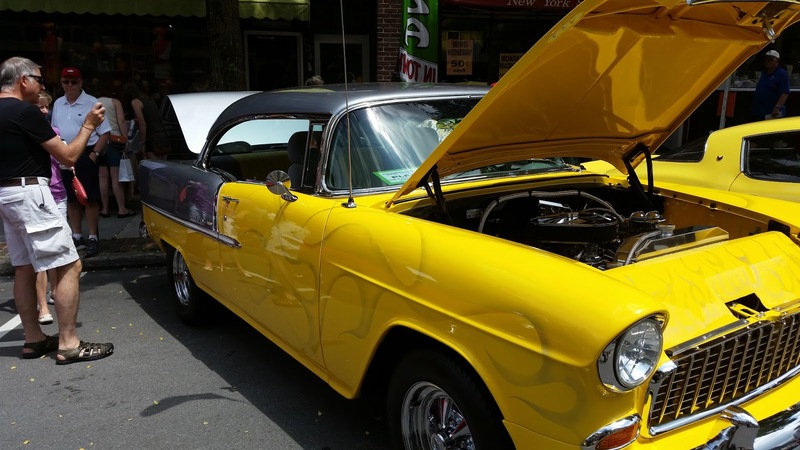 Every Fathers' Day weekend, Bellefonte Cruise rolls into town. 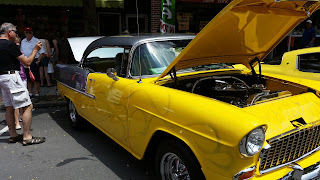 This is the 29th year for the event that brings automobile aficionados into downtown Bellefonte. A Friday-night sock hop kicks everything off and the fun continues through the weekend. This year's "Cruise" attracted thousands of spectators and featured more than 300 cars, trucks and motorcycles. Thus ended a full day's worth of activities in Bellefonte. Day two included a walking tour, which I will save for another blog entry. Meanwhile, those interested in visiting may want to check out a few upcoming events in this scenic and historic area. Love your intro, Stephanie. I had to explain it to my grandson because he thought something bad happened to you in Bellefonte. But his smile was as big as mine hen he understood. 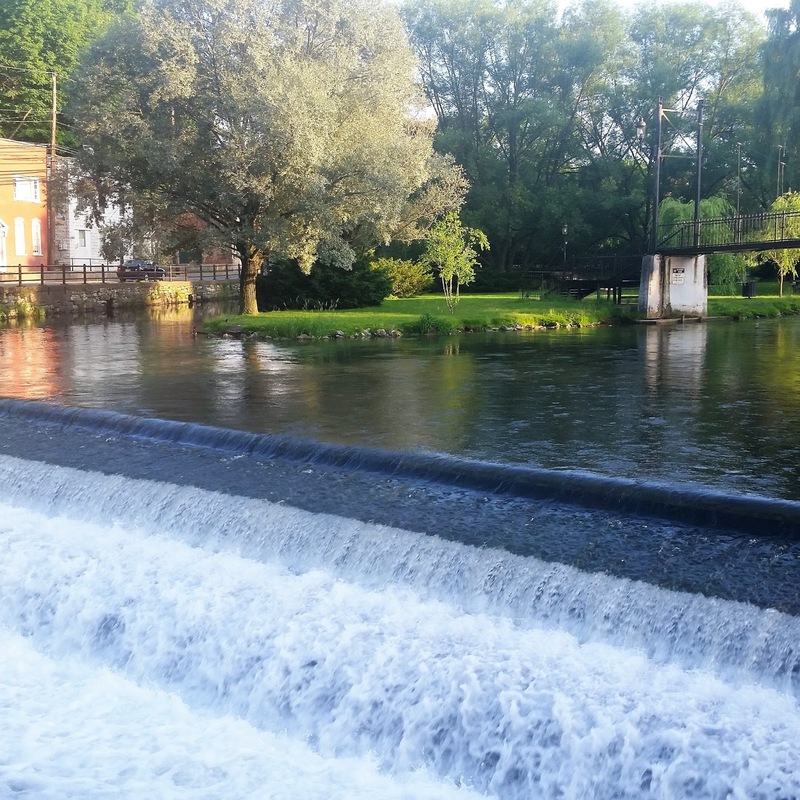 Hope we will see you in Bellefonte again very soon! Thanks for all your kind words. Yes, it is indeed a nice respite from the hustle and bustle. So the genuine beauty is the way that I understand that there Cate Blanchett Anti Aging Products is somebody up there dealing with my spirit.